Long before the Automobile Association of America, there was another AAA: the Automobile Aristocracy of America. The founding members were Charles E. Duryea who in 1892 made the first gas-motored automobile in America run on the road, Henry Ford who demonstrated his first horse­less buggy in 1893, Elwood Haynes who did the same in 1894, Ransom E. Olds who built and operated a steam-driven vehicle in 1891 and produced his first successful gas-driven car in 1897 and Alexander Winton who built an automobile that would run in 1895. The Cugnot Steam Traction Engine was built in France by Nicholas Cugnot (1725-1804), a French military engineer. It is said to be the first self-propelled vehicle built for road use, and was used as an artillery tractor. In 1769, Cugnot demonstrated his vehicle to government officials in Paris. It ran for 15 minutes and attained a speed of 2 miles per hour. Those five men, each working independently, without knowl­edge of the other’s problems or help from the other’s experience, were the progenitors of the gasoline aristocracy of America. And what an aristocracy! Hard-headed, keen-minded, brusque, pol­ished, overalled, tailored, egotistic, modest, whisky-drinking, teetotaling, blue-blooded, common clay, theorists, scientists, me­chanics, producers, promoters, salesmen, Americans! However, not one of them invented the automobile. Nicholas Joseph Cugnot, an imaginative Frenchman, deserves credit for that. He built a three-wheel steam-driven trac­tor in Paris shortly before the Declaration of Independence was signed in America. It was the first vehicle known to run under power generated within itself. And it was wrecked during while attempt­ing to turn a corner at three miles per hour. 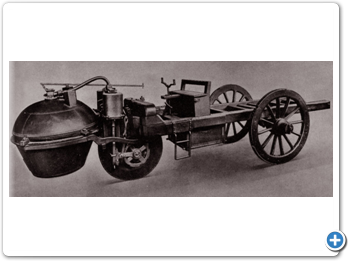 Another hundred years passed before George B. Selden, a young attorney, of Rochester, New York, conceived a gas-powered vehicle, and that was based to some extent upon Euro­pean ideas. And it required a third of a century to get that auto­mobile built so that it would run--in 1905. During the century several persons, notably in England, had developed steam-driven road vehicles. In its later decades several others, mostly French and German, had constructed gas-motored carriages that would run. William Morrison of Des Moines, Iowa, generally receives the credit for building the first electric automobile in America, in 1891. But that was an electric, powered by a storage battery. In the next few years machines of similar type grew in favor and multi­plied in numbers as did steam cars such as those built by the Stan­leys, Whites and others. Their day of ascendancy was compara­tively brief. Gasoline soon proved itself to be the life blood of the automobile industry. Those men who recognized the possibilities of that explosive fluid, and developed machines in which they utilized its power, were the pioneers of the stupendous American automobile industry of today. Those five men--Duryea, Olds, Ford, Haynes and Winton--started the gasoline aristocracy of America. To them--all of them--must go the honor. To Ford alone, perhaps, will be conceded the glory, the power and the wealth.